Don't worry! You didn't accidentally nibble on a psychedelic mushroom!...I think. Paula Graham kept her eye on the sky and a chromatic lunar light show exploded out of nowhere like a Pink Floyd concert. Concentric colored rings hooped around the moon: rainbow hues of red, green, purple and blue. Kaleidoscopic atmospheric phenomenon is not limited to the big fiery ball in the sky—the moon can also put on a show. What happens when you combine water droplets and lunar light? 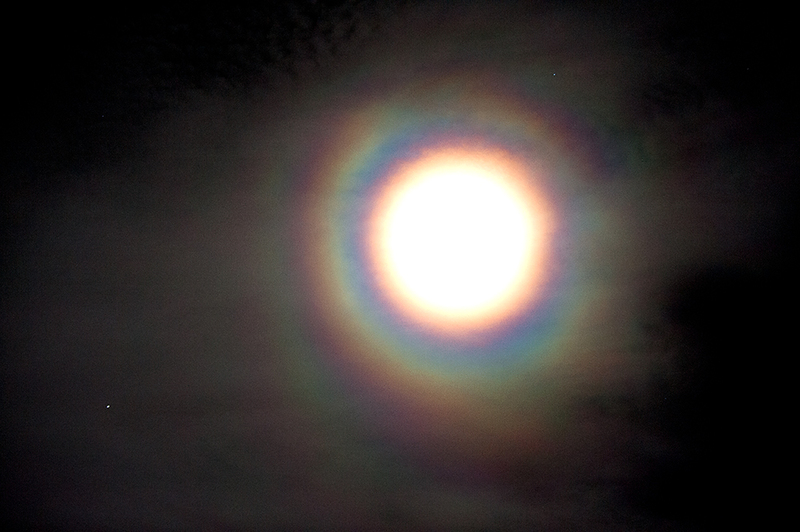 Usually nothing…but sometimes…if conditions are just right…a lunar corona can materialize out of thin air. Literally. Clouds or low temperatures may forge diamond dust, and depending on the angle of these icy prisms (or water droplets) — lunar light may diffract and reveal a rainbow of colors. Many types of dust can cause a lunar corona. No mushrooms. Just dust. Sorry. Wait until moon is near full! Thanks for sharing your observation, Paula! Keep your eye on the sky! Click here and subscribe to Paula’s blog! Paula’s gorgeous photographs are certainly making the rounds today! I enjoyed reading your well documented post and Paula’s psychedelic moon was the icing on the top. Diamond dust clouds — such a poetic term! Paula’s photograph came out quite nice — the rings are sharply defined and the colors are vibrant….I’m jealous! Haha. You should be jealous 😜. Don’t look so down! You’ve taken some gorgeous moon shots, as well — just not as good as Paula’s! I’m joking 😝. I’d be a great comedian; just as long as I wouldn’t have to get on stage! That is much more exciting than I would have managed to make the post, Your knowledge is so extensive in this field. I was very pleased that you could use my photo, which included indeed some shivering. The whole show came and went within 20 minutes. Amazing stuff. You did my effort proud . Thanks for sharing your photograph! I haven’t seen a lunar corona in a handful of years. I used to see moon halos and lunar corona quite often when I was younger, but not anymore. Halos and arcs are transitory events, so if you see one, and have a camera nearby — don’t waste time — because halos have a habit of vanishing into thin air.